I stare at the words on the screen in front of me and begin to despair. There are no labels in sight even after I make a thorough search around the check-in kiosk. Then, I suddenly realise that the row of standalone countersIhad walked past a few seconds earlier could perhaps hold the key to solving my predicament. With my luggage in tow, I start retracing my steps back to one nearest to me. My hunch was spot on. The machine promptly spits out a fresh printed label as soon as it scans my passport and boarding pass. After that, with just a few easy-to-follow steps, the conveyor belt quickly despatches my bag towards the cargo area. Getting past the immigration section has never been this easy. I get past by employing the same procedure with my passport and boarding pass while having my fingerprint scanned. I am very impressed. 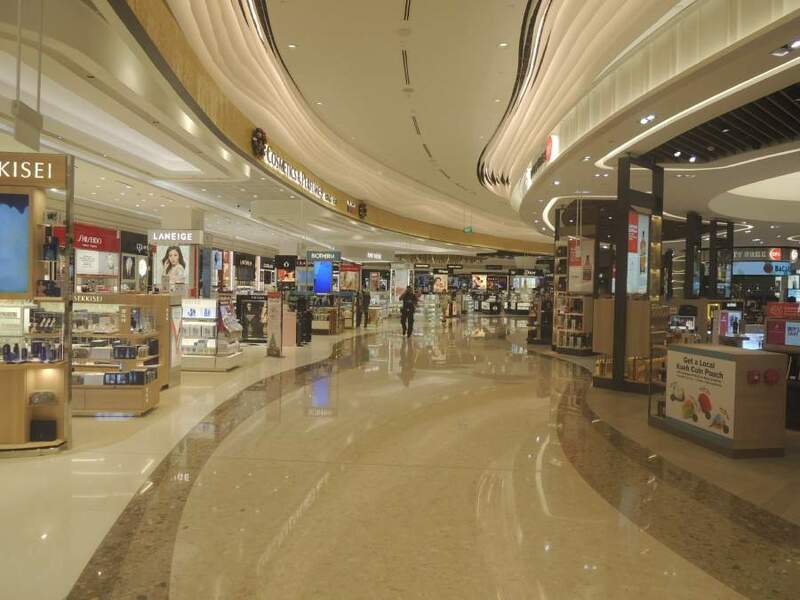 Changi Airport’s Terminal 4, the most automated of its kind in the world, has certainly lived up to its reputation of providing travellers with an unbelievably fast and seamless experience. Since its official opening two years ago, this two-storey building with a gross floor area of 225,000 square metres marks a critical milestone in Singapore’s aviation history. The only time when I have to interact with another human is during the security screening process. That being said, the involvement of the ever vigilant airport workers is still kept to a minimal. They only step in to assist with possessions going through metal detectors when the need arises. It is also a pleasant surprise to find out that laptops can now remain in carry-on bags. In spite of all the simplicity provided by automation, security checks are certainly not compromised. With its state-of-the-art full-body scanning machines, I feel that the process is even more meticulous and thorough. The automated start-to-end self-service systems in this new terminal allows travellers to go through the entire process and enter the departure hall in less than 15 minutes. With so many kiosks all around, I actually do not recall seeing a queue of more than two people at any one time! Taking a quick glance at my watch, I notice that there is loads of time left before I board the plane. This is indeed another pleasant surprise. It has been common practice among travellers to arrive at least few hours earlier to compensate for the cumbersome and time consuming airport procedures. Now I can just take my time and no longer need to run to the departure gate with minutes to spare. 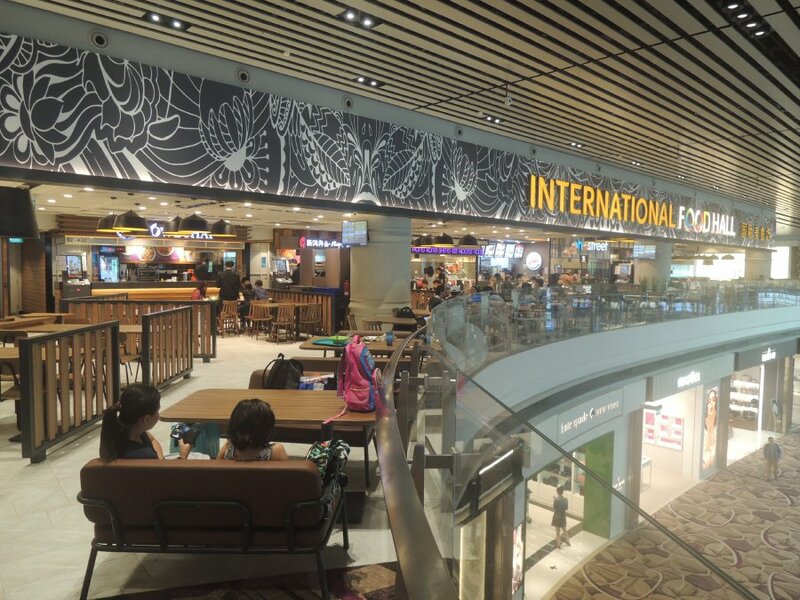 Once inside the departure hall, it becomes even more obvious that this terminal is in a league of its own. Fully carpeted and filled with ample seating areas, travellers can be forgiven for thinking that they are at an exclusive lounge instead of an airport. Even the arrangement of the shopping outlets with their eye catching pop-up stalls along the walkway give the illusion that I am walking among the haute couture shops in Orchard Road. I am pleasantly surprised that in spite for all the state-of-the-art concepts, the airport authorities managed to incorporate local cultural and heritage influences into the terminal’s interior decorations. I get my first taste after coming across a gigantic replica of a floral Peranakan tiffin carrier in front of a boutique. This quintessential Straits Chinese kitchenware immediately sets the mood as I begin immersing myself in all things Peranakan in the terminal. 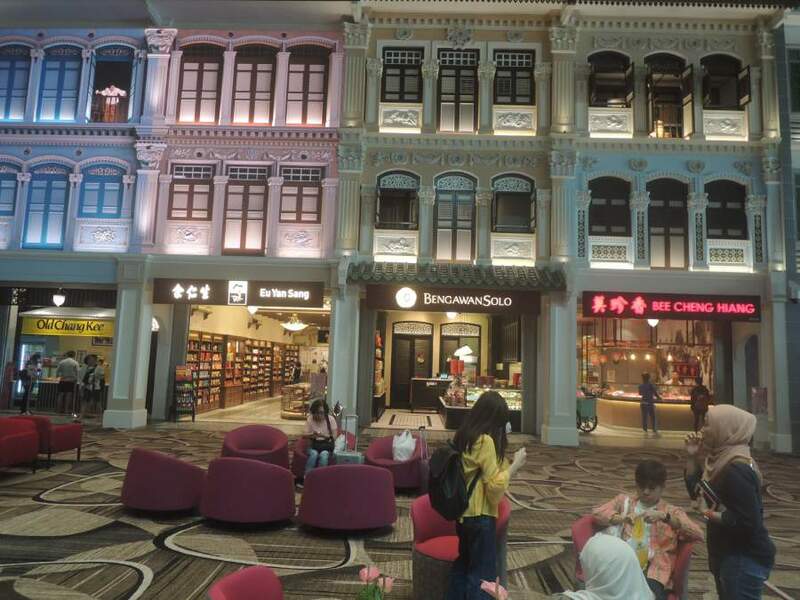 Located on the first floor is the Peranakan Gallery which is a good place to learn about this unique and diverse community. Here I learn that ‘Peranakan’ actually comes from the Malay word anak which means child, and can also be loosely translated as ‘born locally’. Over the past 200 years, merchants from all over the world settled in Singapore, married local women and started their own families. While a vast majority of Peranakans in Singapore are Chinese Peranakans, there are also other Peranakan communities of other ethnicities, such as Jawi Peranakans (descendants of Indian Muslims), Chitty Melaka (descendants of Hindu traders) and Eurasians (European Peranakans). Venturing further, I begin to learn about how the Peranakan material culture has successfully inspired a life of comfort and luxury in the past. Colourful objects like tea pots and serving trays together with intricately carved side boards and mother of-pearl inlaid chairs show distinct influences from China, India, Southeast Asia and Europe. Interestingly though, despite the uniqueness of the Peranakans, I find out that that there is no single dress that distinctly defines the Peranakan identity. It seems that the fashion choices of the Peranakans, the ladies in particular, vary according to the occasion, purpose and time. Although the Peranakan Chinese women or Nyonyas adopt the traditional costumes of the Malay archipelago, such as the kebaya (short blouse) and sarong (full length skirt), but they developed a particular aesthetic in their choice of colours and motifs. At the same time, the Nyonyas also asserted their Chinese identity by wearing cheongsams and qipaos which were all the rage in Shanghai during the 1920s. Beginning from the early 20th century, a distinctly different Peranakan-styled kebaya began to emerge and gain popularity. Deviating from the traditional version, it featured extended pointed lapels and featured repeated colourful floral bouquets in its design. The Nyonyas almost always pinned their kebayas with kerongsangs (jewelled brooches), an inspiration probably acquired from Europe in the late 19th century. Looking closely at the different types of kebayas on display, I become acutely aware of the presence of several iconic Singapore Airlines (SIA) uniforms in the midst. I am intrigued that these SIA sarong kebayas, designed by French couturier Pierre Balmain in 1968 and famous the world over for being synonymous with the Singapore Girl icon, were actually inspired by the traditional kebaya worn in this region. The uniform’s signature batik print was designed to emphasise Malayan identity and hospitality during the time when Singapore Airlines was part of the now defunct Malaysia-Singapore Airlines (MSA). I like the brightly coloured floral sprays which interlace the cloth surface. Printed inblue,green, red and burgundy, these colours help to denote the rank of the flight stewardesses on duty. Peranakan Chinese men, on the other hand, adopted Western attire to project a modern, cosmopolitan image. After all, most of their wealth was derived from dealings with their European counterparts. 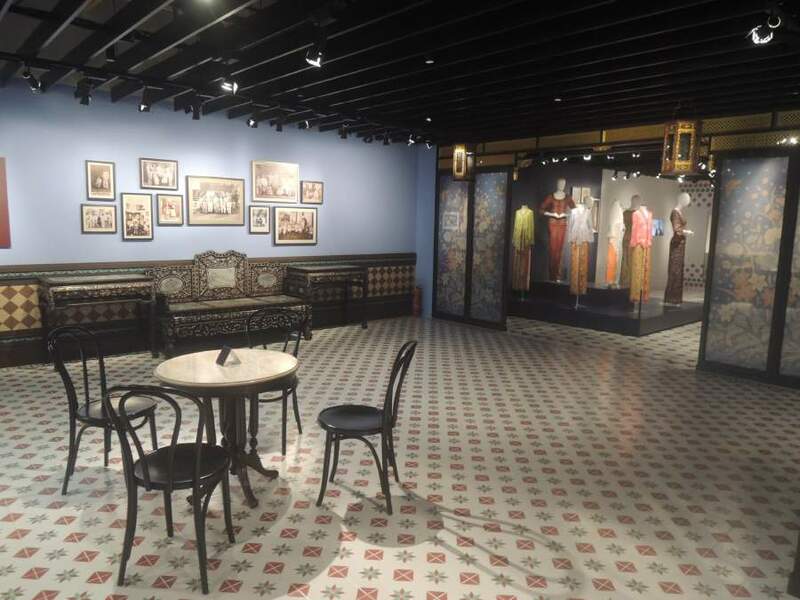 The exhibits at the gallery end with displays emphasising the persistence of Peranakan fashion and cuisine in today’s modern world. I learn that modern Peranakan ladies assert their identity differently from preceding generations. The traditional sarong kebaya is now seldom worn except on special occasions. Instead, it is normally paired with jeans and casually worn over a tank top. Elaborate and time consuming Peranakan recipes have also been updated by chefs. Employing new cooking techniques and ingredients, modern chefs have come up with novel dishes while staying true to the time tested familiar Peranakan flavours. Leaving the gallery, I take the escalator back to the ground floor and head towards the retail space at the Heritage Zone. This section is positioned at the opposite end of the terminal from where I first entered after the security check. The traditional Peranakan shop front facades here are simply breathtaking. Apart from their attractive colours and designs, these facade designs chronicle an era in arts beginning in 1880 with the introduction of the Baroque style. This style which is characterised by Western classical details can be seen at Tanjong Pagar Road, Pagoda Street and Temple Street in the Chinatown area. Buildings began sporting highly decorative high-relief motifs when the Rococo came in to fashion during the early 20th century. Designs incorporating flowers, birds and bats were chosen for their auspicious symbolism as well as their decorative. Today, Rococo-styled shop fronts can still be seen in the Jalan Besar and Geyland Serai areas. Peranakan elements only began appearing on shop facades in the early 1920s. With fretted facial boards under roof eaves and intricate floral tiles, this architectural design presents a more subdued take on the Rococo style. Flourishing until the late 1930s,this type of shop house can still be seen in the areas around East Coast Road. Strolling past the modern decor facade style which happens to be the last one featured, I suddenly notice on a nearby television screen that my departure gate has just opened. Stealing one last look at this style that began appearing in 1936 and lasted well into the post-war era, I quickly set off using the easy to follow and strategically positions signages as my guide. I am overwhelmed by a strange feeling when approaching the departure gate. 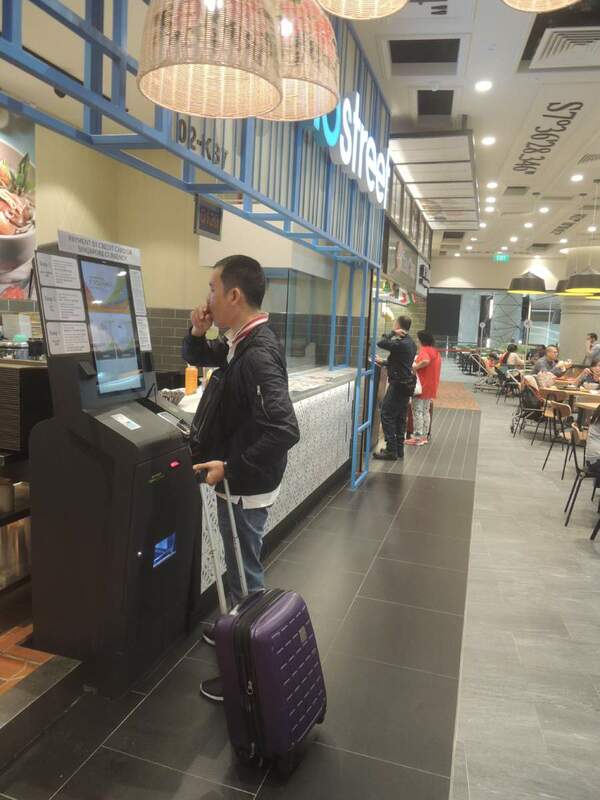 The absence of airport workers and the sight of automated turnstiles give an illusion like I have travelled through time, leaving the traditional world of the Peranakans behind and arriving in the future. “How are we going to board the plane? There is no one here,” a worried looking elderly lady sitting next to me enquires. She remains unconvinced even after I point to a sign explaining that travellers only need to scan the barcode on their boarding pass in order to board the plane. Well, I guess that for some of us, it will take some time to get used to all these new innovations.